Learn How Princeton University Press + Tizra Collaborated to Create a Revolutionary, Researcher-Friendly UI For Complex Online Publications! How hybrid search technology helps users find relevant content faster. Deep search tools that uncover the value within large, complex publications. How to manage the metadata within your publications. 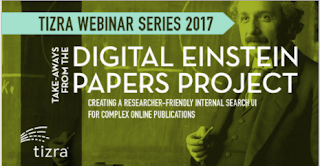 This webcast focuses on THE DIGITAL EINSTEIN PAPERS – a collaborative project powered by the Tizra platform that enables readers to experience the writings of Albert Einstein in unprecedented ways. A newly developed search tool improves discoverability by allowing users to perform hybrid searches of full-text and structured metadata across volumes containing thousands of articles, letters, lectures and other writings, with easy navigation between original German texts and English translations, as well as extensive explanatory footnotes, introductory essays, and links to the Einstein Archives Online, where there are thousands of high-quality digital images of Einstein’s writings. Abe Dane is Co-Founder of Tizra, where he manages operations, and is responsible for relationships with clients including the American Medical Association, Scholastic Library Publishing and Princeton University Press. Before Tizra, Dane worked in print and digital publishing for 20 years, at organizations including Hearst, MIT and Ingenta. In 1995, he launched Hearst’s first magazine website, and was founding editor of HomeArts, a mass market destination that eventually became one of the web’s top ad revenue earners. Since then he has helped guide the development of numerous online products for organizations ranging from Eastman Kodak to Oxford University Press and McGraw-Hill. Early in his career, he was Science and Technology Editor at Popular Mechanics, where he was responsible for most of the magazine’s cover stories. His work there won a Knight Science Journalism Fellowship at MIT. Click to register today to save your spot!